It's hard not being as famous as your big sister. 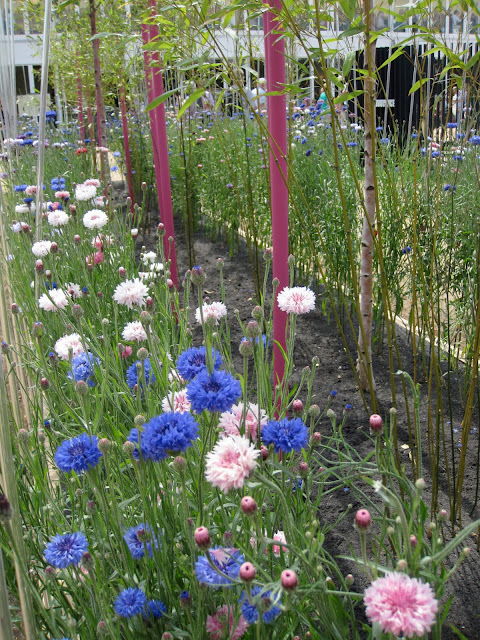 Hampton Court Flower show plays second fiddle to Chelsea. Being a poor relation myself, I still wanted to go. One big difference between Chelsea and Hampton: Hampton sells plants, lots of plants. Birts have these specially designed plant carriers on wheels for stuffing...lillies as tall as skyscrapers, every achilleas known to mankind, clematis yet to be named, salvias you can only dream of, delphiniums on steriods, cannas from the national collection, papavers too delicate to touch ... gentians, auriculas, dahlias, agapanthus, streptocarpus, gladiolus, etc. etc. etc.. This show doesn't have the big name designers, but it's much bigger than Chelsea: after all it is on the grounds of Hampton Court Palace. It's more a show for the "people". This year featured a scarecrow contest for school children and HOME GROWN (celebrating the diversity of products that can be grown in the UK) and a section on sustainable gardens. 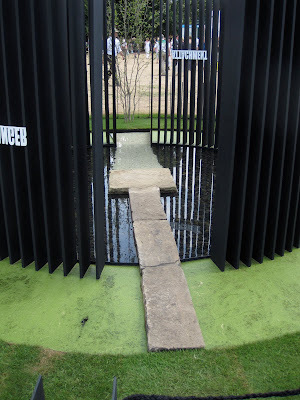 I gravitated to the Conceptual Gardens. "The garden aims to represent the workings of the human mind and its desires; how we relate to our inner mind, and in turn relate to the outside world. 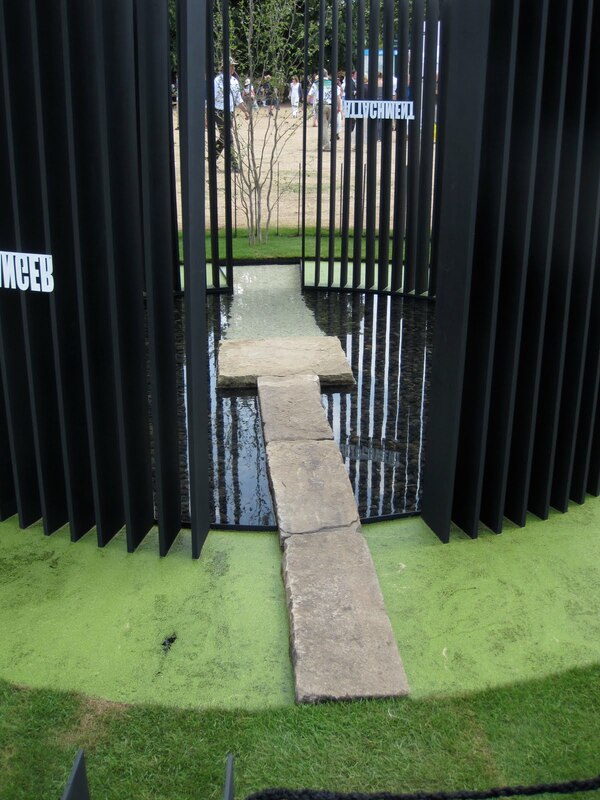 The circular pond represents our mind, with the black wooden slats separating the 'inner' subconscious workings of our mind from the 'outer mind' of everyday experience. 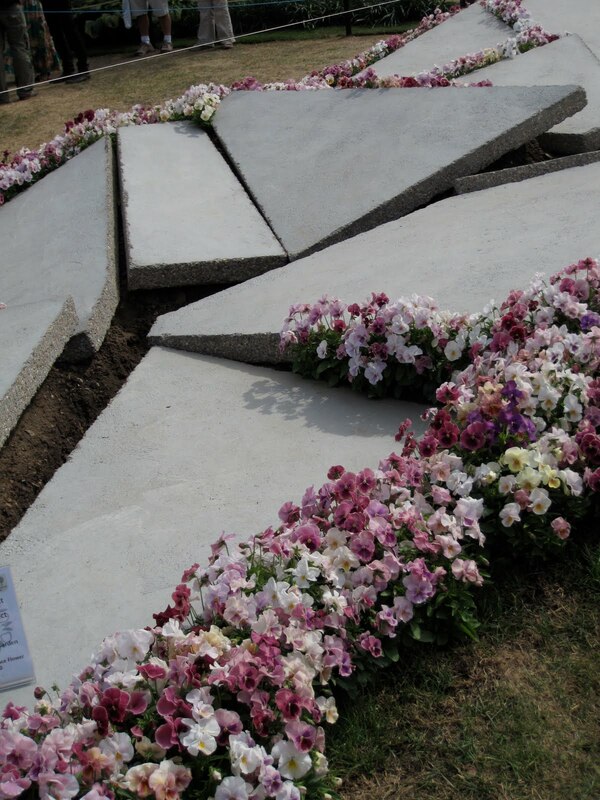 The 108 slates represent the 108 earthly desires that Buddhists believe cause human suffering. The slats themselves have iron words fixed on them, hung upside down. These words represent our desires, which are intentionally unreadable from the outside." The text may separate the intellectuals from the more mundane among us, but as a garden experience it really worked. 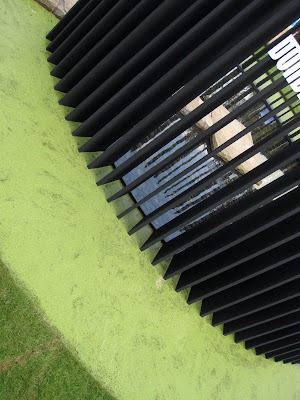 "The garden has a disguised political agenda: encouraging visitors to consider notions of homophobia, psychogeography, memorilisation, citizenship, and the political ownership of public space. 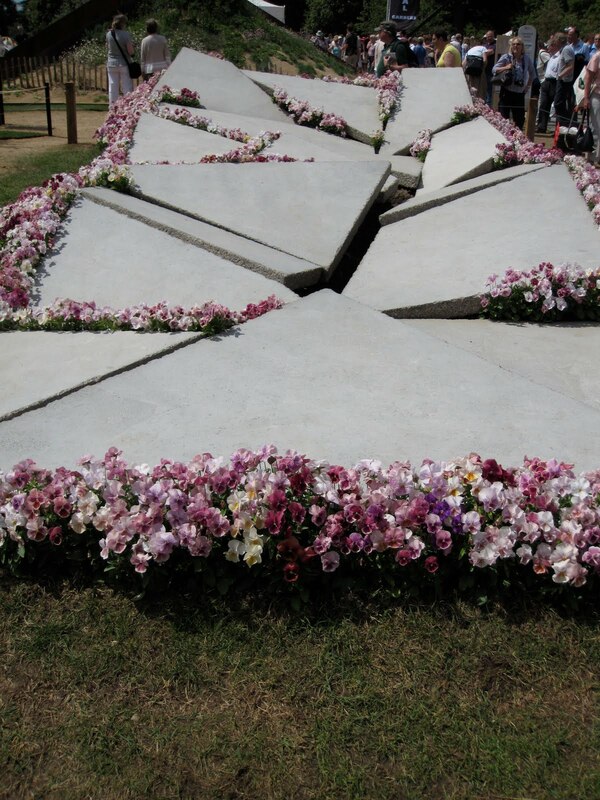 The design is a first time collaboration iwth garden designer and brother of the artist, Tom Harfleet who together have created a confrontational concrete structure referencing the pavement of the city. The sculpture is a metaphoric reflection on the disruptive nature of homophobic hate crime on contemporary society." The description is illuminating and without it, I am pretty sure the message would be lost. Compared to the other gardens, it was out of place, radical, unfamiliar and disquieting. This was possibly the point. "Supermodel embodies concepts of thinness. Trapped within a tall, thin cage of vertical rods and reminiscent of a catwalk, this garden represents the idea that thin is the only definition of beauty." 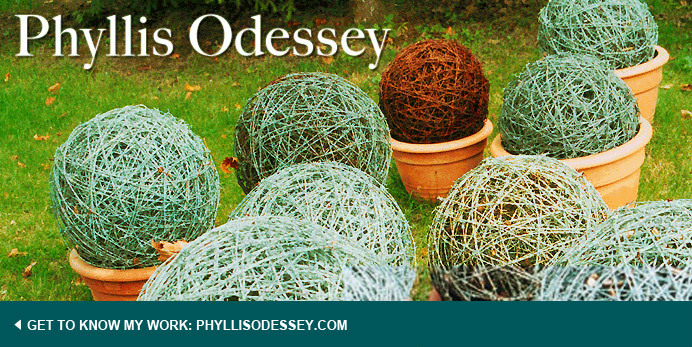 Although the description does little, the garden itself was arresting. 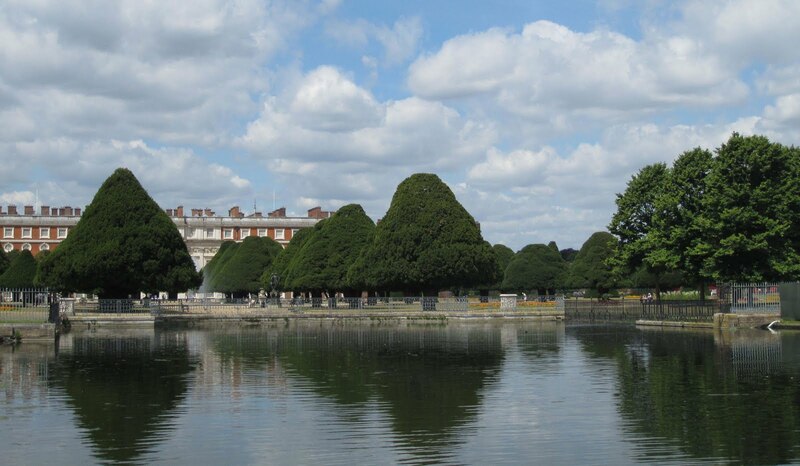 Hampton Court was built to rival Versailles. In fact, between Henry VIII and Cardinal Woolsey, Hampton Court has a history of contenders and adversaries. And even though the Flower Show may not compete with Chelsea in terms of design; it has its own vibe. At the end of the day, in the car park, tables covered with white damask, wine glasses, some olives and people chatting with each other. Sometimes, being in second place has its advantages.